Compact Twin Tub Washing Design: This is our portable mini compact twin tub washing machine which is easy for you to operate. Large Capacity: Washing tube: place clothing in the wash tub section, rated washing capacity: 11 lbs. Works for Whirlpool, Kenmore, Cabrio model washing machines only. This is a washing machine tub puller tool. Product TypeTub Puller. Sensible Product part number CTP-1. Tub Seal Equivalent to Whirlpool P/N's W10006371, W10324647. Kenmore / Sears 11021112011 Whirlpool 7EWTW1409YM0 Whirlpool 7MWTW1750YW0 Amana NTW4501XQ0. Kenmore / Sears 11021182010 Whirlpool 7EWTW1509YM0 Whirlpool 7MWTW1750YW1 Amana NTW4600YQ0. In addition, this machine features a built in drain pump and a drain pipe which allow you to easily drain out dirty water. With this laundry washing machine, you will find washing is an easy job. Don't hesitate to buy it now! It is light and small so that can be moved easily. And it has adorable appearance. The washer features a 6.6lbs load capacity. It saves water and electricity. Good helper of your laundry. Do not hesitate to buy one. This washer is ideal for caravans, student flats and small accommodation where space is limited. The two tubs, one for washing and one for spin drying will be useful to you. The machine runs off 110v power and will take up to 8lbs capacity for washing and 4.4lbs capacity for spinning. Nuestra lavadora de doble bañera es la solución perfecta para lavar la ropa en un entorno compacto. Las dos bañeras, una para lavar y otra para secar te serán útiles. Cuando abres el agua, debes permanecer cerca de la lavadora para vigilarla porque no deja de llenarse de agua por sí misma. Pyle PUCWM22 Pure Clean Twin Tub Washer with Spin - White. Condition is New. Shipped with USPS Priority Mail. simply insert detergent and water and watch it work thanks to the transparent tub container. Turbine interacts with ultrasonic, clean clothes efficiently and quickly. Ultrasonic high frequency for high sterilization rate, removes dirt effectively. 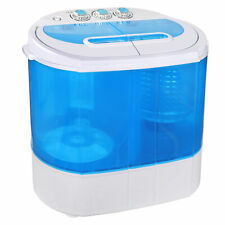 The lightweight and mini size washing machine is convenient and portable. LG Stackable Front-Load Washer / 4.5 cu. ft. / Wild Cherry Red / WM3670HRA. Condition is Used. Very good condition. Used for less than two years. The two tubs, one for washing and one for spin drying will be useful to you. The machine runs off 110v power and will take up to 8lbs capacity for washing and 4.4lbs capacity for spinning. Top load twin tub compact design. I know I did. There is no going wrong with this portable washing machine. The two tubs, one for washing and one for spin drying will be useful to you. The machine runs off 110v power and will take up to 8lbs capacity for washing and 4.5lbs capacity for spinning. Designed to fit specific Whirlpool manufactured washing machine models including Kitchenaid, Roper and Kenmore. Robertshaw is the OEM manufacture for Whirlpool on this item. You are getting an OEM part direct from the source. Whirlpool Actuator Part Number W10913953. Motor, Shifter with 6 Prong Receptacle. Product TypeActuator. 【Compact Twin Tub Washing Design 】: This is our portable mini compact twin tub washing machine which is easy for you to operate. 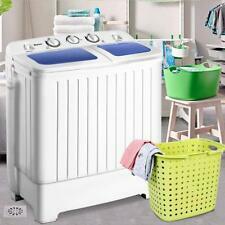 【Standard Capacity】: Place clothing in the wash tub section, rated washing capacity: 11 lbs. Washing Machine Water Inlet Valve for Electrolux Frigidaire Part Number 134959340. Designed to fit specific Electrolux manufactured washing machine models including Crosley, Frigidaire, Gibson, and Kelvinator. The two tubs, one for washing and one for spin drying will be useful to you. The machine runs off 120v power and will take up to 10lbs capacity for washing and 6lbs capacity for spinning. Our machine features a drainage tube which allows you to easily drain out dirty water.